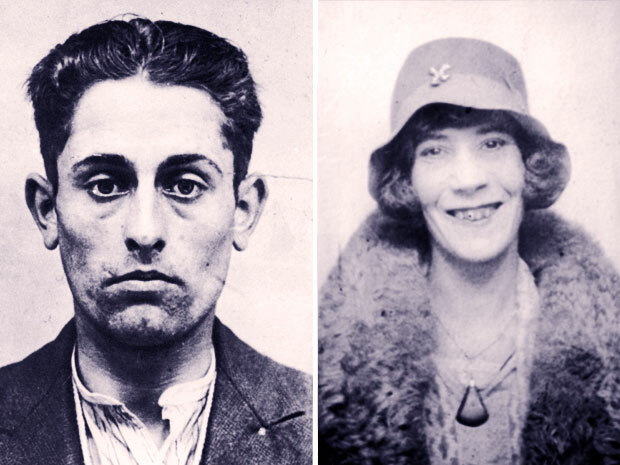 Dancer turned prostitute Violette Kaye, 42, began a relationship with Tony Mancini, a waiter and petty thief 16 years her junior, whose real name was Cecil Lois England. She and Mancini lived together in a basement flat at 44 Park Crescent, Brighton. Mancini later claimed that she had stormed out after an argument on 10 May 1934, and had gone to work in Paris. However, on or about that day Violette was murdered and her body put into a trunk in the basement at 52 Kemp Street, Brighton, Mancini’s new lodgings, along with the rest of Mancini’s possessions on 14 May. By coincidence, a trunk was deposited at Brighton station early in June and when it was opened on 17 June it was found to contain the torso of a woman, aged about 30, who was five months pregnant. Her legs were found the next day at the left luggage office at King’s Cross station in London. Police began making house to-house searches relating to the first trunk when they came across Violette. Painters had complained of the appalling smell emanating from number 52. The police broke into the basement and the trunk was opened on 15 July. Mancini was arrested two days later at Blackheath in southeast London. Violette’s skull had been fractured and the Crown alleged that a hammer found at Park Crescent had been the murder weapon. The trial opened at Lewes Assizes on 10 December 1934 and J.D. Cassels, KC, and Quintin Hogg led for the prosecution. Norman Birkett, KC, and John Flowers, KC, defended Mancini who claimed he had come home from work at the Skylark Café to find his girlfriend dead “… she was on the bed… blood all over the sheets… I got frightened”. Pathologist Dr Roche Lynch confirmed that there was morphine in Violette’s body. Pathologist Sir Bernard Spilsbury admitted that a skull fracture from a fall would be indistinguishable from one from a blow. Birkett suggested that someone high on drink or drugs could have fallen down the steep stairs to the basement flat. Asked why he had not called the police when he found Violette, Mancini replied, “The police? With my record?” He suggested Violette might have been murdered by a client. After two and a half hours’ deliberation the jury returned a verdict of not guilty. On 28 November 1976 Mancini confessed to the News of the World that he had murdered Violette Kaye. They had fought, she attacked him with the hammer, he wrested it from her and struck her in the heat of the moment. The identity of the woman in the second trunk was never established.